If music strikes a note with area kids, there’s a good chance their lives are touched by Gettysburg’s Carrie Trax. Not only is she a music teacher at Emmitsburg Elementary School—her “day job”—but Trax also serves as assistant marching band director at Gettysburg Area High School, music director for Gettysburg Area High School’s musicals, a vocal instructor and performer at Gettysburg Community Theatre, and she’s actively involved in the Gettysburg Presbyterian Church’s choirs. Trax, 36, began her musical path with piano lessons at the age of 5, and is currently in her 10th year of teaching at Emmitsburg Elementary where her students include the next generation of budding 5-year-old musicians. “Little ones are so fun to work with…they leave saying, ‘Mrs. Trax, you got a song in our heads!’ And I say, ‘That’s my job, to put songs in your heads,’” she playfully declares. She believes music plays a starring role in the development of life skills such as confidence, goal setting, and perseverance. 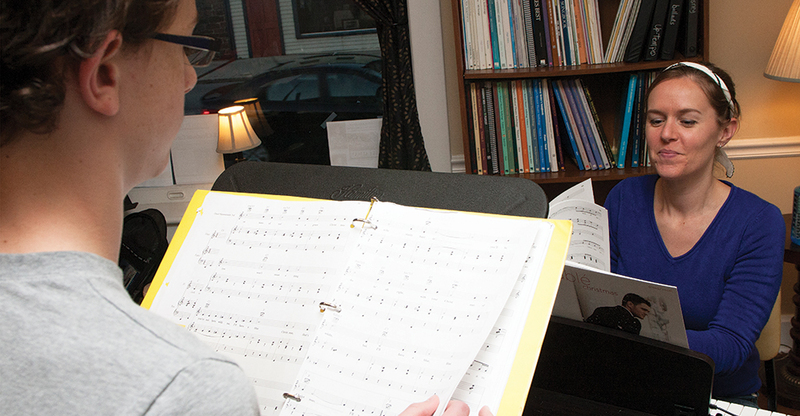 One of the highlights of her work as a private vocal instructor is finding the right song for each child to perform—a process she says allows them to channel what they’re feeling into music. After Trax and her husband graduated from Michigan State, they relocated to Pennsylvania, following her parents to the Gettysburg area. Today, her father David Conklin serves as band director at Gettysburg Area High School, and she just completed her fourth year working under him as his assistant. And how does dad describe the experience? “I never thought this opportunity would come…We think alike and she’s a wonderful help in preparing for band camp—it’s a bonus to work with your own daughter,” Conklin says. This winter and spring you can catch Trax’s work as musical director of “Catch Me If You Can” on stage at Gettysburg Area High School—alongside another man in her life, as her husband Greg serves as director. Plus she’ll be performing in “Chicago” at Gettysburg Community Theatre. Somehow her many musical and family roles blend in perfect harmony.